"I feel like a complete idiot. Does it mean I'm in love?" Even now, nearly twenty years after his death, the career of Fran�ois Truffaut is hard to figure. Can you imagine one of today's popular film critics turning into a first-tier director? Un film de Gene Shalit, say? Almost certainly not, and Truffaut's accomplishments are even more remarkable for not being prissy, academic exercises. They're steeped in an appreciation of movie history, of course, but homage doesn't interfere with his storytelling capacities. One of Truffaut's most important contributions to film history, other than his own movies, is an excellent book of interviews he conducted with Alfred Hitchcock, and in Confidentially Yours, which would turn out to be Truffaut's last picture, he gives more than a passing nod in the direction of the master of suspense. You can sense the director having fun with the tone of the movie—it doesn't have the arch, edge-of-your-seat sensibility of something like Vertigo, nor the rebellious nouvelle vague spirit of Jules et Jim. But like Shoot the Piano Player, made two decades earlier, Confidentially Yours is based on an American crime novel, and its closest affinity in the Hitchcock canon is probably to something like To Catch a Thief, variously lighthearted and dangerous, with an unlikely pair at its center. 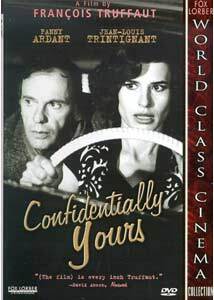 Here it's Barbara Becker (Fanny Ardant), who works as a secretary in a real estate office, and her boss, Julien Vercel (Jean-Louis Trintignant), on whom she harbors a crush. Trouble in paradise, though: Mme. Vercel is stepping out on her husband, and the movie opens with a hunting "accident" of one of her lovers, Massoulier. Vercel is the prime suspect for the murder, and Barbara, despite her secret love for him, harbors obvious doubts about his innocence. (Even before the news of the murder comes to their office, he fires her, for insolence, in dealing with his wife.) Soon the manhunt is on—Vercel wants to travel to Nice, to check up on the missus, but since he's a wanted man, Barbara goes in his stead, as he hides out in the office. Too much detail about the plot will spoil it for you, so I won't elaborate any more. But it's clear as you watch this movie that you're seeing a master at work, even if it's on material that doesn't have the greatest ambition. And Truffaut's efforts are aided especially by the gifted cinematographer Nestor Almendros, who also died far too young. Almendros' black&white photography gives this movie from 1983 an obviously retro feel, and aside from being generous to the actors with his camera, he's able even to endow inanimate objects with a certain humanity. (The Porsche of the dead man is shot with the care generally reserved for loved ones, for instance.) Truffaut is happy to let his actor's faces do the work, and not bludgeon us with motivation—only late in the picture does Barbara confess her love for Vercel, but given the depth of feeling on Fanny Ardant's face, if Vercel didn't know about it, it's because he wasn't looking. There are also plenty of fine little story touches to keep things from getting too serious—Barbara acts in an amateur theatrical group, for instance, and when she decides in an instant to play detective, she's still wearing the costume from her troupe's upcoming production. Her trenchcoat is pure Philip Marlowe, but underneath she's wearing an absurd little outfit for her role in Victor Hugo's Le Roi s'amuse, the play that was the basis for Verdi's Rigoletto. The only thing that's a bit baffling about this movie is its American title. Based on a novel by Charles Williams called The Long Saturday Night, its French title, Vivement dimanche!, pushes things to the next day: it translates as, Finally, Sunday! It's unclear to me why both of those were discarded in favor of a title which makes it sound rather like a movie about pen pals. Image Transfer Review: Almendros' gorgeous cinematography has held up terrifically well, but the source print is pretty full of scratches, dust and dirt. A cleanup job for this DVD release would have served the movie well. Audio Transfer Review: It's hard to know if the movie was Foley edited to death in the mix, or if it's just a transfer problem, but there's an almost fetishistic quality to some of the soundtrack�rustling newspapers, footsteps on pavement, bodies settling into chairs are all unrealistically loud. (Some of them seem as if they demonstrate a Hitchcock-like obsession with small detail, but more often it sounds like an unbalanced mix.) Otherwise, interference is pretty low. Extras Review: Selected filmographies are on hand for Truffaut and the four leading actors (Ardant, Trintignant, Jean-Pierre Kalfon and Philippe Laudenbach), as well as a partial list of awards won by the director. The full boat of Truffaut trailers rounds out the limited package of extras. Also, the film has been newly subtitled, and while the English renderings are generally pretty clear, there are a couple of missteps: "Then you pour the with wine," for example. Also, one of the central characters is named "Lablache," but on occasion he is identified in the subtitles as "Lablanche." It's difficult not to wonder what heights Truffaut might have scaled had he not died of a brain tumor at the age of 52. But in this, his last film, he demonstrates both a tremendous command of his craft and an infectious sense of fun. It's not the grandest entry in the Truffaut oeuvre, but it is a sweet, smart and knowing suspense picture, and looks reasonably fine on this DVD.